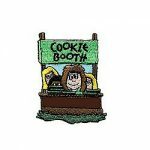 2″ iron-on embroidered Girl Scout patch. 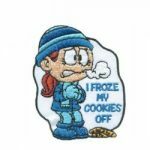 5 reviews for "We Froze our Cookies Off Cookie Booth"
Very cute and appropriate for our first booth sale! 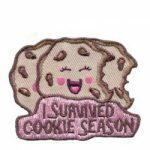 It was fun finding a patch that could help the girls hold onto that memory. Nicely made and ironed on very well. Love them they were perfect ! The girls LOVED these. Favorite badge this year. They said they look like characters from The Loud House- which I guess made them funnier – and they loved the innuendo as tweens. Thank you for writing! Tweens can be hard to please. We LOVED this patch!!! 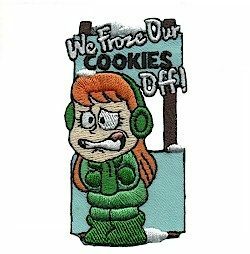 Our very first booth fell on a horribly cold, VERY windy day, and we did freeze our cookies off. But my girls were AMAZING and kept a positive attitude and kept on cheering for cooking sales. This patch was well deserved, and wonderfully made.